One thing you used to see fairly regularly in professional wrestling was people stealing their archenemy’s finishing move and using it against said archenemy. The way they presented it in the match stories had to do with it feeling worse to lose to your own move than to your archenemy’s. 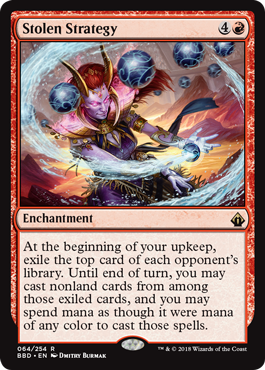 This is basically Magic’s equivalent of that; it’s not entirely new, as we’ve seen with Fifth Dawn‘s Reversal of Fortune, among others. Stolen Strategy is slightly less chance-based than its predecessor. Not only does it scale up very rapidly in multiplayer, but the longer it stays on the table, the better your odds of hitting the conceptual equivalent of a Stone Cold Stunner or Walls of Jericho. That’s still probably not going to be reliable enough for competitive play, but it’ll cause crazy things to happen in Commander and other casual settings, which is enough for the time being. This is a potentially interesting weapon with a lot of people in the same game. Stolen Strategy gives you the ability to pilfer cards from opponents, provided you can cast them. A five-mana enchantment that does nothing immediately is a hard sell in serious formats, but this can put in a lot of work, particularly as it enables you to use mana of any color to cast spells that you find. This obviously plays well in Two-Headed Giant, but it scales well to Commander and casual multiplayer games all the same.